Antarctica is a country covered in snow and ice and totally surrounded by a wide expanse of ocean. The North Pole is frozen sea ice encased by a small expanse of ocean and surrounded by land. They do not! There are no penguins at the North Pole and no Polar Bears in Antarctica. Wally Herbert from Great Britain was the first person to get to the North Pole over the surface, in 1969. There were many attempted expeditions to reach the North Pole. Some say that Robert Peary’s party were the first to get there with the aid of dog-sledges. However, this was later discredited as some say that he could not have got there in the time that he had been away. Many attribute the first person to get to the North Pole as being Raold Amunsden but he and Lincoln Ellsworth and Umberto Nobile and 11 others crossed it in the airship Norge – not on foot. British, Wally Herbert with companions Allan Gill, Roy Koerner and Kenneth Hedges became the first men to reach the North Pole over the ice surface (with the aid of dog teams and air drops). They continued on to complete the first surface crossing of the Arctic Ocean- and by its longest axis, Barrow, Alaska to Svalbard – a feat that has never been repeated. Unfortunately, they arrived back in Svalbard the same day as Armstrong took his first step on the moon and hence, Wally didn’t get the publicity that he deserved. 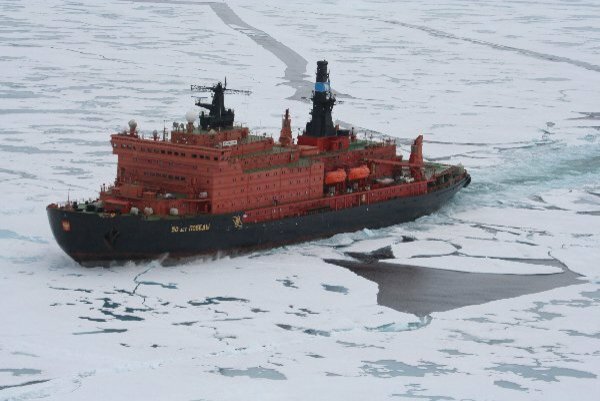 Our voyage was 71st ship to go to the North Pole since opening up commercial voyages in 1990. Not all ships had passengers because the ice-breakers were sometimes engaged to break the ice for another ship. Approx 7,000 passengers have been to the North Pole. There is ice and water at the North Pole. According to leading US scientists at the National Snow and Ice Data Center and the University of Colorado, in June 2008 they said – There is a 50-50 chance that the North Pole would be ice-free this summer, which would be the first in recorded history. I can confirm that the landscape at the North Pole is ice and it is mainly ice in the surrounding area. The water currents have caused cracks and breaks which expose some of the sea water. This freezes over again in the winter so the ice becomes thin 1st year ice. The sun shone the entire time that we were in the North Pole. It was about 45 degrees in the sky and moved at the same height around us during the 24 hours that we were there. Because all lines of longitude converge at the North Pole, it's not technically in any time zone (or, it's in every time zone, depending on your perspective). As a result, Coordinated Universal Time (UTC), as used mostly in astronomy and navigation, is used. It's similar to Greenwich Mean Time (the time kept on the Greenwich meridian, longitude zero) but scientifically more precise. At the Autumn Equinox, approximately September 21, the sun sinks below the horizon, and the North Pole is in twilight until early October, after which it is in full darkness for the Winter. The next sunrise is in early. March The North Pole stays in full sunlight all day long throughout the entire summer (unless there are clouds), and this is the reason that the Arctic is called the land of the ‘Midnight Sun’. In summertime, the sun is always above the horizon at the North Pole, circling the Pole once every day. It is highest in the sky at the Summer Solstice, after which it moves closer to the horizon, until it sinks below the horizon, at the Fall Equinox. As a result of all this, the North Pole is obviously cold. In the winter, when the North Pole is farthest from the sun on the Earth's axis, the average temperature -40 degrees Fahrenheit (-40 Celsius) during December and January, but can dip into the negative 50s. 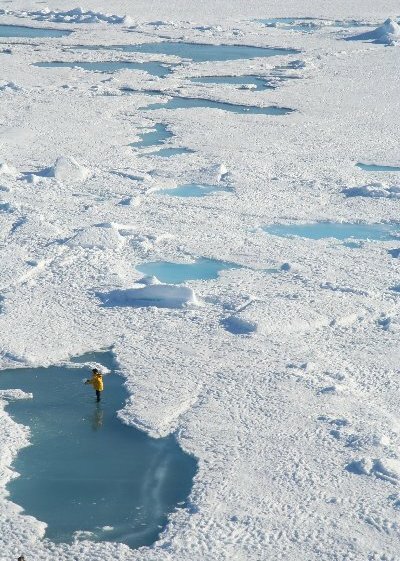 The seawater beneath the ice of the North Pole is a relatively mild -28 degrees F (-33 C). In the summer, the Pole averages 32 F (0 C). But the North Pole isn't as cold as it used to be. If you're standing at the North Pole your speed of rotation is quite slow -- almost no speed at all -- compared to 1,038 miles per hour at the Equator. According to leading US scientists at the National Snow and Ice Data Centre and the University of Colorado, in June 2008 they said – There is a 50-50 chance that the North Pole would be ice-free this summer, which would be the first in recorded history. I can confirm that the landscape at the North Pole is ice and it is mainly ice in the surrounding area. The water currents have caused cracks and breaks which expose some of the sea water. This freezes over again in the winter so the ice becomes thin 1st year ice. The blue 'lakes' are actually ice and you can walk on them! They are blue because they are old ice in which the air bubbles have been compressed out. 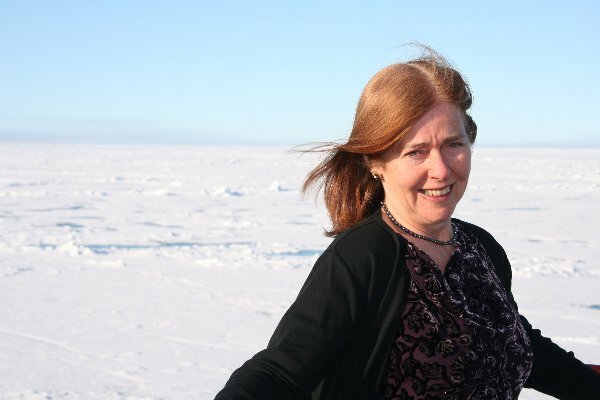 There are no nuclear icebreakers in the Antarctic. They need cold water to cool their reactors and could not survive the heated equatorial water to get there. Some of the diesel ice breakers do move to the Antarctic. The sun shone the entire time that we were in the North Pole. It was about 45 degrees in the sky and moved at the same height around us during the 24 hours that we were there. After June 21, each circle is a bit lower until it dips below the horizon in November and remains missing in action until it starts its upward cycle in February. resulting in abundant terrestrial life. Arctic derives from the Greek word, bear - from Ursa Minor, the constellation which points to the North Star. Ant-Arctic is exactly that - No bear. Bears originated in the far north, and the polar bear thrives on cold. They could not survive a migration south, passing the equator. The North Pole ice is always moving. From the time we parked the ship to the time we departed, the ice had drifted 3/4 mile south east east. You cannot plant a flag at the North Pole and expect it to remain at the North Pole. The ice drifts up to 5 km a day in clockwise motion. In 1893-1895 the Norwegian Fridjof Nansen grounded his ship the Fram, purposely, near Siberia, and drifted within a few hundred miles of the North Pole. He left his ship and skied north getting to N86 degrees 13 minutes, then he turned back before making it to the Pole and he skied to Franz Joseph Land where he found refuge (this was thousands of miles). He arrived home in Norway three years later about when the Fram arrived after drifting in ice for those three years. He proved that the ice is always moving. Many explorers lost their lives walking north while unbeknownst to them, the ice was carrying them some other direction. -- almost no speed at all -- compared to 1,038 miles per hour at the Equator. The Arctic is all of the area on Earth located about latitude 66 degrees, 33 North. The Arctic is primarily a thick flow of ice over an ocean. The land from the north pole down to the northern forests are known as the tundra. The Arctic includes Greenland, which is covered by a 1 mile thick slab of ice. Greenland received its name from the Vikings who were trying to attract settlers. Most of the Viking settlers died. The Arctic ice sheet is four times as large as the state of Texas. The Arctic Ocean is the world’s smallest one. It is roughly 8 percent the size of the Pacific Ocean. The average winter temperature is minus 30 degrees Fahrenheit. During summer, the temperature can climb to plus 50 degrees. The Arctic gets roughly 8 inches of rain a year. The Arctic is the only place polar bears live. More fish live along the edges of the Arctic ocean than anywhere else on Earth. Unlike Antarctica, people live in the Arctic Circle. The Titanic struck an iceberg from the Arctic.